There has always seemed something wrong somewhere with some people in some ways. Students come to The P. S. C., we teach and they learn Chiropractic. They pursue a clinical practice while here and get sick people well. They leave, go into the field, open an office, and get sick people well. A trifle later, something slips and results don’t come. The doctor then says something like this: “I don’t know what’s wrong with Chiropractic, but it fails too often. I guess I’ll look into this, buy that, and try something else.” He may not know it, but he is greasing the track. He gets into a mental and physical slump; he keeps going from bad to worse. Without knowing how or why, he drifts back to some PSC Lyceum. He gets the old idea back again; he hears us tell him Chiropractic is an all-sufficient idea. He goes home, gets out his training stool, steps-up speed; gets down books, and reviews school notes; gets back to the back once more, and finds patients do get well once again with Chiropractic. Out go the adjuncts and modalities! What’s wrong with Chiropractic? Nothing, except that it seems to attract a group of radicals who can’t understand it fully, thoroly, and consistently! What’s wrong with Chiropractors? Nothing more than that they suffer with the same common hoof and mouth dis-ease that other cross-sections of humanity suffer with—the inability to get right with a right principle and practice, and stay with it. Chiropractic is growing more sound year by year; assuming its manhood and objectives; reaching the pinnacle set forth by D. D. Palmer when he laid down the specific principle. Chiropractors—I am sorry to say—in the majority run around in circles; many of them like chickens with heads off. Knowing them as I do, I should be very loath to trust my back-bone to many of them. I can’t blame sick people who write me thousands of the most pitiful, harrowing tales of what they are getting under its name. First. He who is careless, shiftless, sloppy. This type of man has dirty offices, dirty personnel; his office procedure is indifferent. His NCM readings are carelessly made, spinographic work is poorly postured, indifferently exposed, possibly developed in an old developer. He cares little how he reads films. His adjustments are so-so, etc. This fellow is playing carelessly with a careful subject, incompetent with a competent method. He is not getting sick people well with Chiropractic. He is a slipper, mixer, back-slider, seeking other fellow’s grass, peeking around corners for something which he thinks might do what he isn’t doing. He seeks a short easy cut to success. Second. This man is careful, neat, accurate, efficient, competent. You can see it in the way he speaks, looks, thinks, acts. His offices reflect careful personality. They are spotlessly clean; everything in its place and a place for everything. This man is painfully exacting in detail, nothing being too small to be done just exactly right. NCM readings are done correctly, spinographs are clear, developers and hypos are capable of delivering; he studies films and is accurate in study and analysis. His adjustments must be exactly right. This fellow is efficient, accurate, competent, and honest within himself. He has a successful business, his clientele are discriminatory people. His business is of sick people getting well. He checks himself carefully, he does not mix, he stays by Chiropractic because it stayed by him. He realizes the only road to success is the hard way straight ahead. Between these types are mixed breeds that spurt and slip, fight ahead today and grease backward tomorrow; who are up on toes for a while and slide down for a period; who move forward and backward steady by jerks, according to how lately somebody has jacked them up. They are not self-starters; they move only because they attended some meeting, heard somebody talk, which gave them a new shot in the arm and as long as it lasts, they last. When that wears out, they have run down. For every thinker, there are 999 workers; for every employer there are 99 employed; for every worker, there are 9 drones in the hive. For every 9 men there is a fore­ man; for every 99 men, a superintendent; for every 999 men, a boss. The conscientious, careful, competent chiropractor is a necessity on the sick market. Find him and you will get well. Fail to find that fellow and as well throw your money to physicians, unless by the Grace of Innate an accident happens! The principle of Chiropractic is established, fixed, permanent. That cannot be changed. 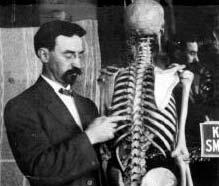 The practice of Chiropractors is careful or careless in ratio as the person is careful or careless. If careful, he is a Chiropractor; if careless, he could be anything but that! Care must be exercised in selection of your “chiropractor” as you would be careful in selection of dentist, physician, surgeon, plumber, or any person whom you pay for services expected, desired, or demanded.